This past weekend I was fortunate enough to attend a women’s retreat in Arizona, an experience I will never forget. This retreat was painful at times as it opened some wounds that I have been suppressing for a long time. But this retreat was also filled with self-discovery that unveiled strength deep within allowing me to not only face but conquer fears. This retreat allowed myself and the women around me to open up, to bare our souls, to share a story no matter how painful to a room full of total strangers without judgement – but rather heartwarming love and support. This retreat affirmed that the journey is about being the best “ME” I can be to be the best for those around me, my family, my friends, my coworkers, my tribe. To stay focused, to stay present, to understand the value of NOW because it is the only thing I have control over. Yes, I will stop dwelling on the past and I will stop fretting about the future. Yes, the sunshine was beautiful and the views atop Camelback Mountain amazing.But this retreat was about giving and receiving; giving support, and gracefully receiving kindness and love. Learning to be authentic, to be a dreamer, to be content, a rockstar, to be worthy, to make no excuses, find strength, be united, have courage, have gratitude, hope and believe. 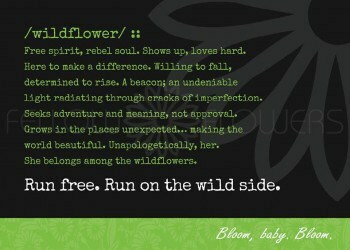 To be a wildflower. Please take time to stop and smell the roses – or wildflowers.